Kids become acquainted with their numbers as they come to life through animation and engage in humorous scenarios. Numbers come to life in the form of cute animations in Minti Kids Basic Numbers, an app designed to help kids become acquainted with the numbers 1 to 10. As kids tap on each number, it comes to life through an adorable animated number that gradually changes into a fun character for a related story. For example, the number one goes scuba diving before its toe is bitten by one crab and the number two becomes a cat that chases two mice. Not only can kids interact with the numbers, but they can do it in seven different languages, allowing them to practice in their native language or begin to learn how to count in a new language. After they’ve been through all ten of the numbers, kids will have a better understanding of each number and will be chanting the counting rhyme that plays in the background of the opening screen. The animated numbers found in Minti Kids Basic Numbers is reminiscent of many other quality kids apps, although the animations do seem to run a bit slow at times. Kids must also get through each number’s lengthy transformation before moving on to the next number without going back to the home screen. Still, kids will forgive the slight lag and the lengthy process to move from number to number as they watch the numbers transform into cute characters. They’ll also delight in the fun sound effects and the peppy music and cheering on the app’s main screen. Kids interact with each number in multiple ways. First, they trace the number to help make it come to life. 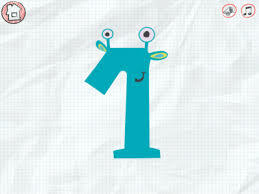 Then, kids further transform the number to help prepare it for its role in a cute, animated story. While the stories don’t have a lot to do with the specific number, they do try to incorporate the number. For example, the number two becomes a cat that chases two mice and the number two is repeated multiple times throughout the short story. This helps kids see the numbers in use. Kids can also access the numbers and stories in seven different languages, giving them a chance to begin to learn to count in multiple languages. As kids interact with the numbers, they respond with funny sound effects, laughter, and silly faces. All of these little animations will really engage toddlers and preschoolers. They may even find themselves repeating what the numbers say or yelling out the catchy numbers chant that plays on the main screen. The price of the app may seem a tad bit high, especially with another popular animated numbers app being offered for free. However, parents should remember that each number is available in seven different languages. The animated stories also help set Minti Kids Endless Numbers apart from similar number apps. Kids will find it easy to interact with the numbers. They’ll also find it easy and very entertaining to change the language and hear the numbers pronounced in new ways. Parent info sections and links to additional apps from the developer are protected by a parental block, so kids will focus on enjoying the cute animations and learning the numbers in different languages.